One of the most well known experimental theaters in Buenos Aires, this venue is far more intimate than powerhouse theaters like the Gran Rex or Teatro Colón. The theater’s interior looks like an old warehouse, the walls are bare brick, and the seats are essentially folding chairs made into bleachers. Connected to the theater is its institute, which offers classes and degrees in acting and technical theater, among others. The theater’s website is well designed and worth a look, but like the plays, it’s in Spanish—a good way to practice if you’re not fluent! reopen in the late 1800’s but, due to a series of mishaps, not actually reopened until 1908. Between 9 de Julio and Libertador, the area devoted to the theater today is 37,884 square meters, 5,006 of which are the building’s foundations. Inside the theater are man different rooms, including the Bust Room, the White Room, and the Golden Hall. The Main Theater, or “La Sala” is shaped like a horse-shoe and many claim that it is one of the most perfect acoustic spaces in the world. Above it all is an illuminated dome, painted by famous Argentine painter Raul Soldi, which depicts various facets of the theatrical life. As a venue, the Teatro Colón is almost a show unto itself. infrequent, but it is still worth a stroll past the impressive facade. The General San Martín Theater is one of the most important theaters in the city. It was inaugurated on the 25th of May, 1960, the sesquicentennial of the Revolución de Mayo. A million people pass through its 30,000 cubic meters of space every year. This enormous amount of space is divided into numerous rooms and performances spaces, each with a unique history and atmosphere. There are a wide range of performances held in this theater, from ballet to highly comedic plays. 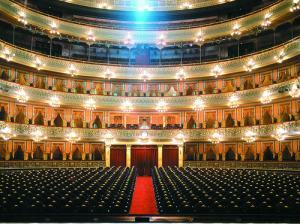 Right now, the theater is also home to many of the performances normally held in the closed Teatro Colón. This theater is the place to go is you want to see a musical spectacle, whether that spectacle be the hottest new Argentine act or an international powerhouse like Bijork or Coldplay. While the quality of the acts may vary—from serious artists to preteen musical sensations—the theater itself has a rich, beautiful interior and its location in the city places you in the heart of Buenos Aires nightlife. 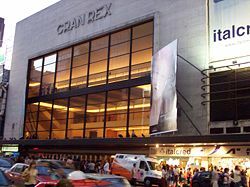 Built in 1937 by architect Alberto Prebisch, the Gran Rex stands only 200 meters from Buenos Aires’s iconic obelisk, also designed by Prebish. 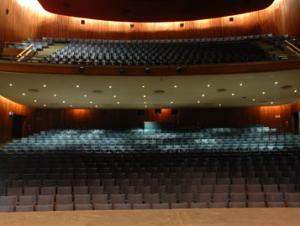 The theater seats 3,300 people and tickets are available at www.ticketek.com.ar. This page rendered in 0.263 seconds.